This Edwardian era hat is elegant in it's simplicity. It features a very wide flat crown, and downturned, oversized brim. Hatpin with swarovski crystals, feathers and a silk ribbon are all that is needed to make a stunner of a style. 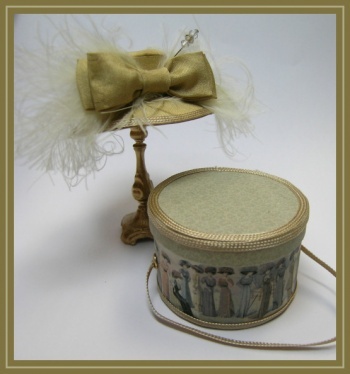 The hatbox artwork is created from scans from my original copies of La Mode magazine from 1912, and is my favorite!! !